Home Reviews	Liberty Gun Safe Reviews: Our Best Picks! Keeping your firearms safe at all times should be one of your priorities in life. There are few better gun safe brands around to give you complete peace of mind than Liberty, read on to see some of the best liberty gun safe reviews. This is one of the biggest and best-known gun safe manufacturers in the US, with quality safes that are made in America and do a terrific job. They are renowned for making big, heavy models that fit a number of guns or rifles in very easily. However, they also produce smaller safes for handguns as well. Of course, there is an extensive range of different types of safe from this company, all at varying prices. This is why we have put together some Liberty gun safe reviews, to make it easier for you to identify the model that best suits you. Take a look at our picks to see what kind of safe you would be best opting for. 5 Which One Should You Choose? 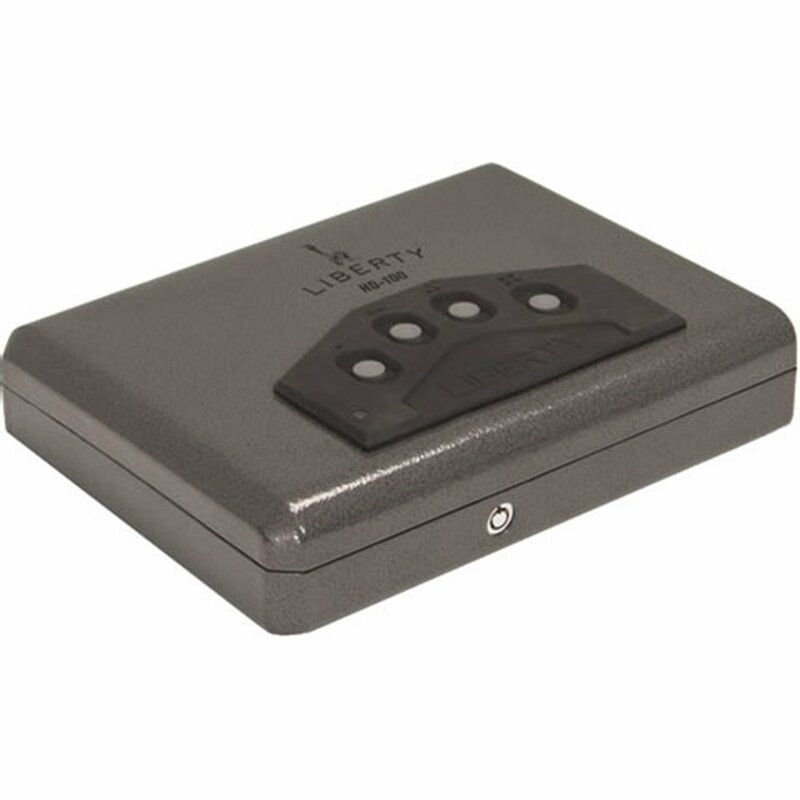 Described on their own site as America’s number 1 producer of heavy duty home safes, Liberty has more than 30 different models in production at the time of writing. They also say that more than 2 million householders have found peace of mind thanks to their products. The brand is famous for their reassuring lifetime guarantee that operates across many of their safes. They will repair or replace any of the safes covered by this guarantee that have suffered fire damage or an attempted break-in. Liberty has been around since 1988 and their headquarters are in Payson, Utah. They started out building just 6 safes a day at the beginning of their history but now manufacture an impressive 450 every single day. While they are best known for their big, powerful home safes, Liberty also has an interesting and varied selection of other types of safe as well. No matter what kind of model you are looking for to keep you and family safe, you are likely to find it from Liberty. To help you understand the different options available to you, we have reviewed a few of their top products. The following Liberty gun safe reviews will help you to understand the pros and cons of some of the most popular models that you might be interested in. If you need fast and reliable access to your handgun then the Liberty HDX – 250 Smart Vault could be the ideal choice to make. This is part of the firm’s Home Defender series and it uses the latest biometric technology so that you can open it with just a swipe of your finger. Fast access in just 1 second is promised, so you will never be left hanging around in an emergency. This model has memory capacity for up to 15 fingerprints. It also includes useful features such as a lighted interior and key backup. This is a handgun safe that has been designed to fit most sizes of handgun inside it. The door is built from heavy duty 14 gauge steel and the product comes with a 5 year replacement warranty on any defects. The fact that it weighs just 16 pounds means that it is highly portable, while the built-in mounting holes make it easy to fix to a wall or floor. Finding a robust yet portable handgun safe can seem like a tough proposition. Thankfully, the Liberty HD-100 safe is perfect for keeping your firearm out of harm’s way wherever you are. It weighs 6.25 pounds and has dimensions of 2.5” x 10.8” x 8.3”. It is built from sturdy 16 gauge steel and has a lighted interior to make it easy to use even if you need to open it in a late-night emergency. The electronic combo is easy to use and gives you the choice of over 1,000 combination options. This model comes with a back-up key so that you can always get access to your guns when needed. It could be used in a nightstand, underneath the seat of a car or anywhere else where you feel the need for extra security. As well as firearms, it could also be used for keeping valuables and important documents in, if needed. If you need to protect rifles in your home them this big, powerful safe could be exactly what you need. This Liberty gun safe measures up at an imposing 59.5″x 24.25″x 22″. It weighs 325 pounds. This is described as the brand’s entry level safe. This means that the price is lower but there is no doubt that it is an excellent model for keeping your firearms safe in. It offers 30 minutes of fire protection and is incredibly strong thanks to the additional steel gusset used in its construction. If you want a really good safe then this is a sound choice to go for. However, if you need a top of the range model then you might be more comfortable with one of the company’s more expensive gun safes instead of this one. There are more impressive models in the Liberty range if you are happy paying a bit more. Anyone who is looking for the very best gun safe on the market should definitely take a look at this wonderful model. The Liberty Fat Boy Junior is capable of holding up to 48 guns in its spacious interior. It weighs a hefty 760 pounds and it has measurements of 60.5 x 25 x 42 inches. This gun safe gives you fire protection for up to 60 minutes, with a Paulson heat expanding seal that expands up to 7 times its size in cases of extreme heat. You get a lifetime warranty with this safe and an incredibly thick 11 gauge steel construction. Steel plates stop intruders from being able to drill through it, while the defensive barrier includes 12 bolts on all 4 sides of the door. Access is gained through a smart electronic lock and overall it is the kind of safe that you can trust to keep even determined intruders at bay. 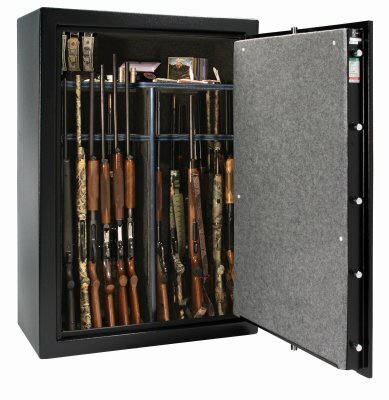 The Liberty gun safe reviews we have looked at should have given you a very good idea of what this brand is all about. Their models are aimed at people who don’t want to take chances with their security. If you’ve decided it’s time to buy a gun safe, it can be helpful to run through these questions to work out which one to go or. Do you need portable access? The simplest decision is around whether you want a portable gun safe or one that sits in your home all the time. Yet, there may also be some occasions in which you can choose a safe that suits you both at home and outside. 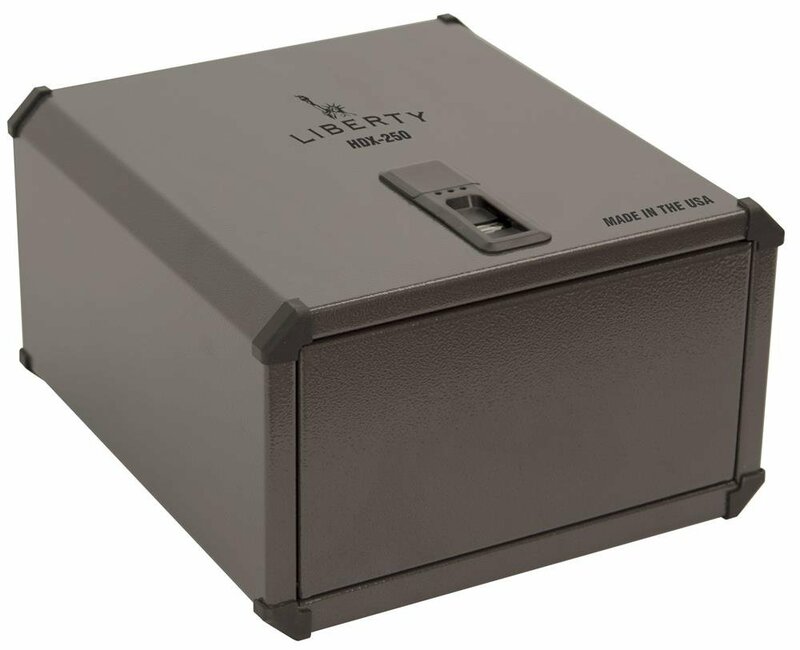 The Liberty handgun safes are solid enough to be of use as a bedroom safe as well as in your car or elsewhere. In which room are you going to use it? If you are going to use your safe at home then you need to find the perfect spot for it. Since these are heavy safes, a basement with a cement floor can be ideal. How many guns are you planning to store in it? It is also important to take the size of your firearm collection into account. Don’t forget to give the collection room to grow in the future rather than run the risk of the safe becoming too small. 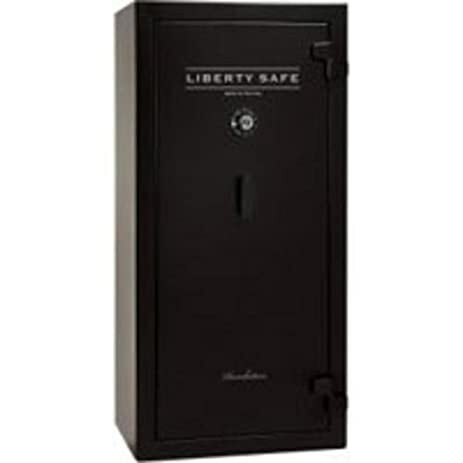 Some of the best Liberty gun safes are massive and will do a great job for you year after year. Do you want to keep other valuables inside it? The fact that these safes are so strong and also offer fire protection means that they can also be used for storing other valuables away. From large sums of money to documents that you can’t afford to lose, there is room for a number of things in here. Just be sure to take the size of these valuables into account when choosing. How much are you happy paying? Lastly, we have seen in these Liberty safe reviews that some of their top models don’t come cheap. This is a quality brand and their prices reflect the materials used and the craftsmanship. Having said that, there are different prices available, so you can look through their range to find the model you are most happy with.